Healthcare delivery, irrespective of the region in the world, is facing the key challenges of escalating costs, aging populations, an increase in a myriad of diagnostic technologies and the rise of chronic diseases which, in turn, is leading to a more and more preventative focus. In short, the current state of healthcare delivery is not sustainable (OECD 2010, http://www.oecd.org/document/11/0,3343,en_2649_ 34631_45549771_1_1_1_37407,00.html, http://stats.oecd.org/Index.aspx?DatasetCode=HEALTH; Pearce and Haikerwal, Med J Aust 193(7):397–398, 2010; Porter and Guth, Redefining German health care moving to a value-based system. 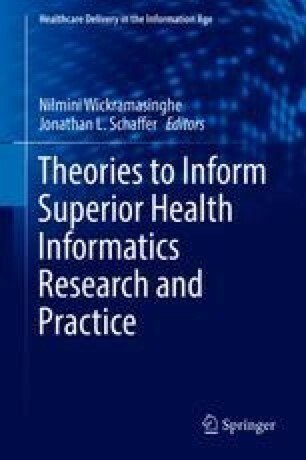 Springer, Berlin, Heidelberg, 2012; Porter and Teisberg, Redefining health care: creating value-based competition on results. Harvard Business School Press, Boston, 2006; Wickramasinghe and Schaffer, Realizing value driven e-Health solutions Improving Healthcare Series. IBM Center for the Business of Government, Washington, 2010). Most countries are responding with various types of healthcare reform and turning to e-health solutions as possible efficiency tools. However, e-health is not a panacea for the maladies faced by healthcare delivery. Moreover, it is important to understand the key macro and micro issues as well as vital people, process and technology aspects if superior and sustainable healthcare delivery is to ensue. The following proffers a fit viability model as a systematic framework to assess and identify critical considerations for designing and developing sustainable e-health solutions. Current national and regional solutions are mapped onto this framework to demonstrate its usefulness and benefits. AIHW. (2010). Retrieved December, 2014, from www.aihw.gov.au/publication-detail/?id=6442468376. Bündnis ‚Stoppt die e-Card!. (2014). Aktion‚ Stoppt die e-Card! Retrieved August 8, 2014, from http://www.stoppt-die-e-card.de/. Chaos Computer Club e. V. (2014). Elektronische Gesundheitskarte. Retrieved August 8, 2014, from http://www.ccc.de/de/elektronische-gesundheitskarte. Department of Health. (2011). Retrieved December, 2011, from http://www.doh.gov.za/. DoHA and NEHTA. (2011). Concept of operations: Relating to the introduction of a Personally Controlled Electronic Health Record System (Article) (p. 159). Retrieved from http://www.egov.vic.gov.au/focus-on-countries/australia/trends-and-issuesaustralia/e-health-australia/electronic-health-records-australia/concept-of-operationsrelating-to-the-introduction-of-a-personally-controlled-electronic-health-recordsystem.html. eHealth Strategy South Africa. (2012). Retrieved May, 2016, https://www.health-e.org.za/wp-content/uploads/2014/08/South-Africa-eHealth-Strategy-2012-2017.pdf. Federal Ministry of Health. (2008). The electronic health card. https://www.commoncriteriaportal.org/files/ppfiles/pp0020_v2_ma1b.pdf.